Paco is a 25 year old male Quaker/Monk parrot who was surrendered as his family could no longer provide the care he needs. He is a pretty low-key guy and we have worked to improve his diet. With some trust, he will be a great buddy for the man he chooses. Paco’s adoption fee is $175. Quakers live for 30+ years and are native to South America. Please follow the process below to meet Paco. Perry is a 12 year old male Senegal. We are still getting to know Perry who is getting more comfortable and has not plucked any feathers since being in his foster home. Typical to the breed, Perry loves his swing! He eats well but can be a little timid. With patience, Perry could make a great pet for the right person. Perry's adoption fee is $200. To meet Perry, please complete an adoption application below. Miami is a 19 year old male Blue and Gold Macaw. He has only had one home and has been well cared for an loved. He is a fantastic macaw in that with a little trust, he actively engages all those around him. Miami's adoption fee is $500. Blue and Gold Macaws live 60+ years and are native to Central and South America. If you are interested in meeting Miami, please follow the process below. Meet Frederica, is a 33 year old female yellow-nape amazon/BFA hybrid. She loves her healthy food and is truly comical. Once she gets to know you, she will be a friend for life! She was surrendered due to changing abilities in her adoptive family to be able to care for her. Frederica’s adoption fee is $350. If you are interested in meeting Frederica, please complete an application below. Tilly is a female parakeet who loves her disco ball! She was transferred to CTPR from the New Haven Animal Shelter, through our rescue transfer partnership. She is a little skittish and we are still getting to know her, but her training and diet conversion to pellets is underway! Parakeets live for 10+ years and are native to Australia. All CTPR parrots are tested for Psittacosis, PBFD and eat a natural pelleted diet. Parakeets May be adopted as singles ($30) or pairs ($50) and generally come with their supplies to get them started and aid their transition to a new home. If you are interested in meeting them, please follow the process below. Willie is a 1 year old male eclectus. This sweet, interactive boy deserves a loving, experienced and knowledgeable home. He’s on a healthy diet and enjoys exploring his foster home. Willie’s adoption fee is $450. To submit an application to meet Willie, please complete an application below. ADOPTION PENDING - Sonny is an 8 year old male Dusky Conure. He is an absolute love and an attention seeking pal once he trusts you (a pretty quick process), but only to women! Dusky conures live for 25+ years and are native to South America. Sonny’s adoption fee is $250. Petal and Buddy are a bonded pair of parakeets. They are incredibly adorable together! Petal (4 year old female) has a history of breeding so we are working to improve her diet and reduce her risk of laying any more eggs. Buddy is her son (and grandson as a result of 'accidental' breeding) is 1.5 years old. Parakeet adoption fees are $30 for a single, $50 for a pair, and include a cage, perches, toys and food to get them settled into their new homes. All have been tested for Psittacosis and PBFD. Fill out an application below to meet them! Belvedere is a female parakeet, transferred to CTPR through our rescue-partnership. She has started her hand training and thinks this treat thing is pretty yummy! Buddy a 3 year old Green Cheek Conure who deserves a final home to call his own. He has a HUGE personality and thrives on confident attention. GCCs live for 25+ years and are native to South America. Buddy's adoption fee is $250. If you are interested in meeting Buddy, please follow the process below. Maddie is the complete package! 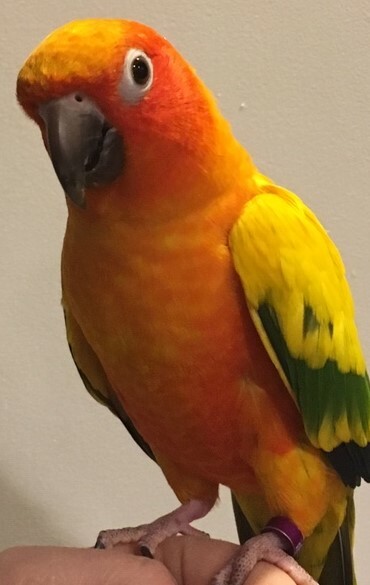 10 year old female sun conure who loves attention, head scratches and to snuggle. Sun Conures live for 25+ years and are native to South America. To meet Maddie, please complete an application below. 4 year old Lola is a female eclectus who is looking for a loving, patient and knowledgeable home. Her adoption fee is $450. If you are interested in meeting her, please complete an application below. ADOPTION PENDING - Azul is a 3 year old male Green Cheek Conure who was surrendered as his human mom was unable to provide for his needs due to an increasingly demanding schedule. Azul has a tough-guy personality but does well with confident people. Green Cheek Conures live for 25+ years and are native to South America. Azul's adoption bee is $250. We are always working with potential surrenders and placements. submit an application to be pre-approved. Kiwi is an adult sun conure. He does well with a confident person who he learns can be trusted. Kiwi is very sweet and comes out of his shell in the right environment. He loves other conures for company. Kiwi's adoption fee is $200. Please complete an application below to meet Kiwi. Check your state's regulations before applying to adopt a Quaker parrot - there may be an updated version of this map. We know that they are not allowed as pets in GA, NJ, PA.
Quincy is a baby (hatched in 2018) Quaker/Monk Parrot. He was recently knocked from his tree during a storm and unable to rejoin his flock. He was found by a Good Samaritan and with the help of our friends at South Wilton Veterinary Group, we were able to take him in. We are acclimating this little one and have begun hand-taming. Quakers/Monk parrots are native to South America and live for 25+ years. Quincy’s adoption fee is $300. If you would like to meet Quincy, please complete an application below. Sunny is a presumed male, adult sun conure. He was surrendered as his owner was no longer able to provide him with the attention and time he needed and deserves. He will need an experienced conure owner with the time and dedication to train and gain the trust of this handsome boy. He has SO much potential! Sun Conures live for 25+ years and are native to South America. To meet Sunny, please complete an application below. Birdie and Hedwig are two 4 year old parakeet girls who are looking for a new home. They are increasingly sociable and are very personable. Birdie and Hedwig’s adoption fee is $50. They come with recent vet testing, a cage, toys and supplies to get them settled into their new home. If you are interested in meeting them, please complete an application below. Meet Luna! She is a 1.5 year old female Dove. She was surrendered by a family member of someone who realized that they were not able to take care of her. She enjoys bath time and is quite sweet. Luna's adoption fee is $40. She has been tested Psittacosis negative. Doves can live up to 30 years. Parrots have a VERY long lifespan. While reports vary, some parrots have lived to approximately 100 years old!! Conures live approximately 25+ years; while African Grey, Amazons, Macaws and Cockatoos generally live 60+ years. NEVER feed your parrot a seed-only diet!! This is the same as eating junk food everyday and leads to fatty liver disease and other health (such as malnutrition) and developmental problems. Please visit our Links and Resources to learn more about proper parrot diet and care. Parrots can die from Avocado, Rhubarb, Apple Seeds, Oven and Teflon Fumes and much more - visit our Links and Resources Page for more information. Parrots are very intelligent! They need a variety of toys which need to be rotated often, and offer them enrichment opportunities. Parrots love attention but can be very picky about, protective over, and aggressive toward others as a result of who they choose to like and dislike. ALL ANIMALS BITE. But this is usually because they are scared or people haven't heeded their previous warnings - they may have learned that this is the only way humans 'listen' to them. Expect to spend time on positive-reinforcement training. Consider an Adult/Elderly Parrot. While babies are cute and generally more willing to go to anyone, they will go through puberty and their temperament often changes. If you are prepared for this and have trained your parrot well, you should 'weather the storm' just fine. However, this is usually when most parrots are surrendered and/or bad habits are reinforced. Please educate yourself and understand what your parrot is trying to communicate to you. Adult/elderly parrots have a more consistent temperament and are more settled in their needs, likes and dislikes. Many parrots go through hormonal and molting cycles in Spring and Fall. This is normal, but generally makes them more grumpy. Why are there so many steps and visits involved in CTPR's Adoption Process? Our adoption process is standard for/comparable to other parrot rescues who are truly committed to the well-being and long-term placement of the parrots in their care. Many of the parrots that are surrendered to us have already been in 3+ homes by the time they are 8 years old - usually due to no fault of their own! This much movement has the potential to result in numerous behavioral 'problems'. Given their long lifespan, we aim to find our parrots' true (or as close to as possible) forever homes. Multiple visits have ensured the consistency and commitment of both the parrot and the adopter. On many occasions a parrot that is now truly a member of our adopter's family, did not 'come-out-of-its-shell' until a 2nd or 3rd visit and would have been overlooked by the adopter. In other instances parrots first thought to be a good match have proven otherwise. We are happy to work with you should you choose to make the commitment. CTPR DOES NOT Facilitate International Adoptions. Out of state adoptions may incur an additional travel fee - please inquire before submitting your application. We are completely volunteer-run. All of our volunteers have 'real jobs' and multiple other life commitments. Please be patient, we will reply to you. Thank you for choosing to adopt first!! Please read everything on this page first to familiarize yourself with our Adoption Procedure. The adoption fee is generally between $100 -$500. Cages are usually included. A portion of your adoption fees may be tax deductible. The adoption form (below) must be completed by someone over the age of 18 years old, and only by the person who will be the bird's primary caretaker. 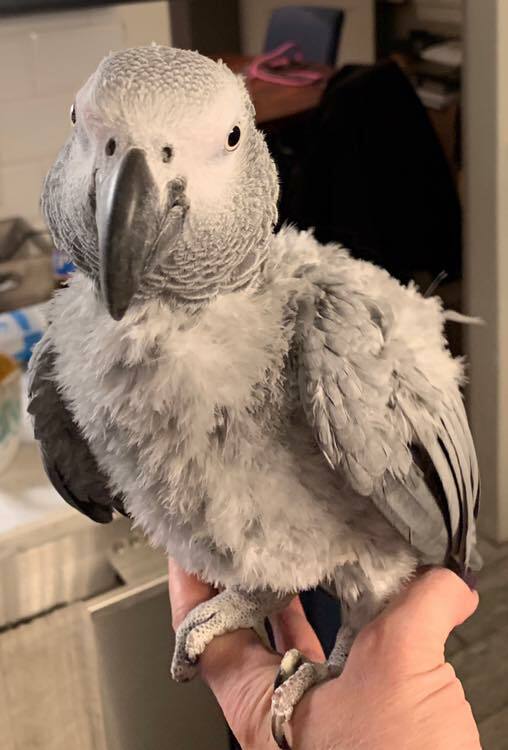 We will contact your landlord first if you rent your home - tell them to expect our email/check their spam -, and then a representative from Connecticut Parrot Rescue will email your references. We THEN contact you to answer all your questions. Once these steps are completed, you will receive an email to set up your first visit to CTPR. All future correspondence will be completed by email. We do not allow same day adoptions - a minimum of 2 visits are required to ensure an optimal match as well as one visit with the parrot and a CTPR representative in your home. Questions about specific birds will only be answered once we have received a completed application form. We require an initial home visit and may conduct a follow-up visit in your home with the parrot within 90 days of the adoption from CTPR. We will NOT adopt birds to homes that already have a bird of the same breed but a different gender. We do not support breeding; mistakes happen, and increased hormone levels in the birds can result in negative behaviors as well as can impact their health. By submitting an application you agree to CTPR's procedures and practices. CTPR is a completely volunteer-run organization. It may take up to two weeks to receive a reply. If you do not receive a reply within that time frame, please re-submit your application to CTPR. Please do not continue to email CTPR for a reply - you are adding to the delay. We do allow adoptions to applicants with no experience, cats, dogs, young children, etc. However; each situation is assessed on a case-by-case basis based on the particular parrot's needs, previous experiences and personality. 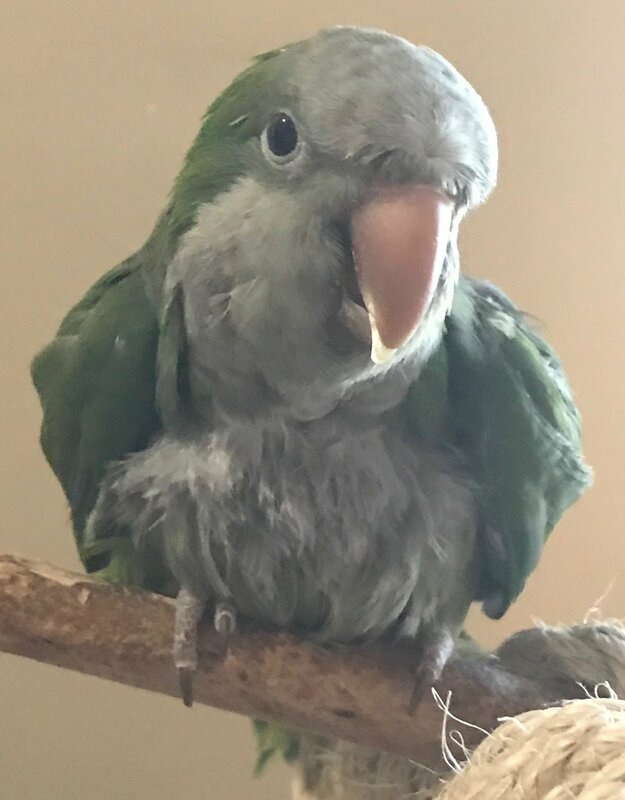 We do allow out of state adoptions, but generally not more than 2 hours away from Connecticut Parrot Rescue - please check with us first. CTPR works with a network of other organizations. If we do not have the optimal parrot for you, we will keep your information on hand until another suitable parrot is available at CTPR and we will provide you with other rescues' contact information. Events are a great way to meet some of our available parrots. If you are interested in meeting a particular parrot, complete the application and waiver, and let us know which event you are planning to attend and which parrot(s) you are interested in meeting. We will try our best to facilitate the introduction - although this cannot be guaranteed. Submitting an application does not guarantee you will be able to adopt one of our parrots. Adoptions are approved at the sole discretion of Connecticut Parrot Rescue and its appointed representatives. All of our birds come with recent veterinary records and have groomed beaks, nails and wings. We strive to provide you with as much information about each bird as possible, however we do not always receive a complete history when a bird is surrendered or found. If you have questions about the application process, visit, food, cages, cost, etc. please STOP! Read the information above before completing the application form. I understand that completing and submitting this application does not guarantee that I will be able to adopt a parrot from CONNECTICUT PARROT RESCUE. 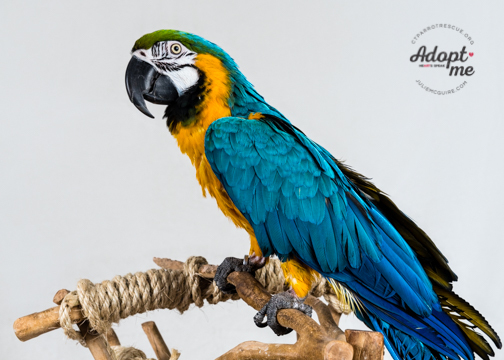 Each adoption is at the sole discretion of CONNECTICUT PARROT RESCUE and its representatives, which strives to place each bird with the most suitable home, regardless of previous applicants, number of visits or mutual interest in a bird. CONNECTICUT PARROT RESCUE reserves the right to terminate the adoption process at any stage if deemed necessary. Thank you for your Adoption Application! Our volunteers will be in touch with any questions. Please check your spam. Please email us any veterinary information relevant to your application (info@ctparrotrescue.org). If you have not received a reply in 2 weeks, please re-submit your application. Thank you for choosing to adopt! Our senior boy Charlie was adopted in April 2019! Amazons live for 50+ years and are native to Central and South America. 8 year old Gracie was adopted in March 2019! African Greys live for 50+ years and are native to Central Africa. 1.5 year old Marshmallow was adopted in March 2019! 11 year old Charles was adopted in March 2019! Cape Parrots live for 40+ years and are native to South Africa. 33 year old Simon was adopted in February 2019! Amazons live for 60+ years and are native to South America.